With time, files you store on your hard drive get fragmented, which cause a slow down in your computer because of the multiple places it has to check on your drive for these pieces. To have your computer run more efficiently, Windows has a built-in tool to help deframent these files. Now here is when and how you should use it. Windows 10, Windows 8 and Windows 7, automatically performs a defragments of files for you. This is on a schedule (by default, once a week). However, it may not always run consistently, so if files are taking longer to load or just to double-check, you can see how fragmented the drive is in Windows. 1. Search for “optimize” or “defrag” in the taskbar and open the disk optimization tool. 2. Choose your hard drive then click Analyze. If you have an SSD, this option is not available and grayed out. 3. The percentage of fragmented files will be in the results. There’s no rule of thumb about how fragmented your drive should be before you defrag it. It is recommend to keep fragmentation percentages under 5%, this will ensure the defragmentation process doesn’t take too long to finish. 4. When you are ready to defragment your drive, click Optimize. Pick a time when you do not need the computer for anything else, so Windows can defragment the drive efficiently. 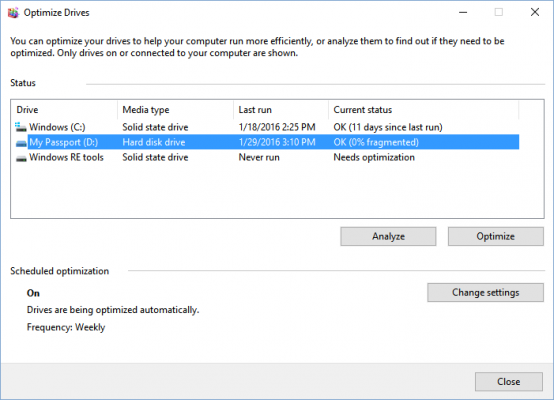 When done Windows will say your drive is 0% fragmented in the Optimize Drives utility. With SSDs, it is best to just Windows do its own thing. Do not worry about defragmentation. Use the Optimize Drive tool to do a veneraly optimization of the drive, which includes sending the TRIM command to optimize performance. This is not a traditional defrag ofthe SSD.